Eye Health Ingredients Market size was worth over USD 180 million in 2016 and is set to exceed 1.8 kilo tons by 2024. Hectic & busy life schedules along with exposure to toxic materials have an adverse effect on the eyesight of people leading to suffer from an unhealthy vision. Increasing requirement to maintain the perfect “20/20” eyesight has alleviated the demand for eye health ingredients. Consumer awareness towards eye health benefits from carotenoids, zeaxanthin and lutein continues to grow steadily. Growing eye supplement launch numbers will enhance the product demand in the forecast timeframe. The eye supplements accounted for more than 4% of the global supplement launches in 2016. Maintaining strong vision, eliminating free radicals and protection from UV radiation are the prominent features enhancing product penetration. Rising consumer need towards vision sustenance due to growing age-related eye diseases are the factors, driving eye health ingredients market growth. Increasing eye health problems including diabetic retinopathy, age-related macular degeneration (AMD), cataracts and glaucoma will escalate industry growth. As per analysis, AMD disorder caused cancer in more than 50% of cases in the U.S. Global consumer expenditure on AMD treatment was more than USD 200 million in 2015. Increased consumer spending on nutritional products coupled with regulatory support for OTC supplements has positively influenced industry growth. Industry participants are launching different dietary supplement types in the market, based on the interest of the consumers. Magazines, television, internet, articles and ad campaigns are major influencing portals to alleviate consumer interest in supplements demand. However, limited availability and comparatively high costs may impact the eye health ingredients market price trend. Vision ingredients are mostly preferred on prescription due to the multivitamin content. Improper product consumption causing health problems due to over the counter(OTC) products may hinder the eye health ingredients market growth. Eye health ingredients from natural sources will witness growth over 6% up to 2024. Shifting consumer preference to naturally sourced products particularly in Europe and North America will enhance the natural eye health ingredients market size. Rising consumer awareness towards sufferings from chemically synthesized product consumption will fuel the demand for its natural counterpart. High beneficial factors and low processing costs are among the key factors encouraged synthetic eye health ingredients market growth. Vitamin C, dl-Vitamin E and B-Vitamins are the major synthetic products. Up surging consumer consciousness pertaining to animal based product usage for coating or filler of capsules may restrain the growth in the coming years. Lutein and zeaxanthin are mostly used eye health ingredients in the industry. Lutein market size will witness growth over 6.5% up to 2024. 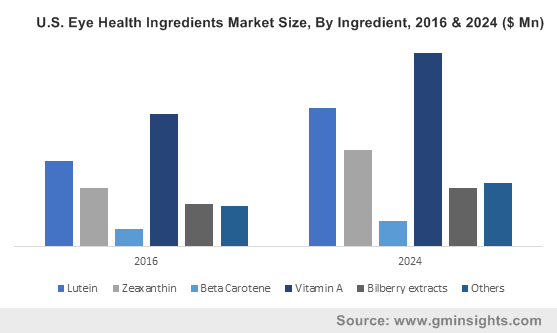 Increasing potential usage in formulated supplementary food and infant formula products will enhance the lutein market size. They are usually combined with other beneficial health components, such as antioxidant vitamins A, E, C, B (B6 & 12) and blueberry extracts, as a basis of anthocyanins, omega-3 fatty acids, and minerals such as selenium and zinc. Rising demand from medical and food industry owing to its high efficiency with less concentration will propel the zeaxanthin market growth. Adequate zeaxanthin consumption through supplements is highly beneficial as it is not naturally produced in human body. The product consumption is comparatively found less than lutein due to its superior effectiveness with smaller dosages. Increasing zeaxanthin production particularly in the U.S. and Japan to meet rising demand will support the market growth. Bilberry extracts will generate over USD 25 million by 2024, higher anthocyanins content and high extraction costs may influence the bilberry extracts market price trend. The product is becoming popular owing to its substantial properties including improving retinal health and maintaining blood sugar levels. Strong potential outlook in medical applications to combat ophthalmologic disorders, vascular disorders and diabetes will enhance the product penetration. Capsule, soft gels & tablets are mostly preferred over other forms due to its ease in consumption and reducing stomach upset possibility properties. The segment accounted for over 40% of the industry share in 2016. Powder form is set to witness significant gains over 6.5% up to 2024. Increase in pharmaceutical drugs consumption along with technological advancement pertaining to product development will positively influence product penetration. Increasing lutein and zeaxanthin demand for dry eye & macular degeneration treatment along with technology advancement in terms of optimum shape maintenance will enhance industry growth. Improving vision, damaging blue light causing retina damage, reducing inflammation is other key factors influencing product demand. Eye health ingredients market is dominated by human consumption, rising vision issues in early age including macular degeneration, cataracts and glaucoma has influenced product demand in this segment. Increasing surgery expenses is another factor motivating consumer towards OTC supplements to avoid heavy expenses on hospitals. Eye health ingredient industry for animal applications will witness high gain at over 7% up to 2024. Increasing animal vision diseases will drive the product demand in this segment. Eye health ingredients market is mainly used in age related macular degeneration disease. As per AMD Alliance International, approximately 26 to 32 million people globally are suffering from AMD. The institute also observed the baby boomers’ generation gets older, the incidence will rise and triple by 2024. This is due to growing age, the level of pigment in macula decreases naturally, thereby increasing the risk of AMD. Dry eye syndrome is another disease occurring globally, it is a situation where the eyes don’t make enough tears, or evaporates too soon. As per analysis, the occurrence of this syndrome can be in more than 30 percent in people aged 50 years or more which makes the consumer more conscious towards eye supplement consumption. U.S. eye health ingredients market is estimated to observe high gains at over USD 60 million by 2024 due regional ophthalmic industry growth. The country had the highest eye health ingredient introductions probably due to the reflect of the popularity of dietary supplements in the country. As per industry analysts, more than 3.2 million Americans, at the age of 40 or older are affected by low vision or blindness. This number is projected to reach more than 6 million by 2024. On a worldwide scale, the U.S. launches accounted of more than 45% of total eye health supplement, which is ahead of Europe (just over 26%), Asia (about 11%), and Australia (over 9%). Europe eye health ingredients market is estimated to witness high gains at over 530 tons by 2024. Rising consumer spending on healthcare and medicines will fuel the regional demand. Russia is a major product consumption nation owing to its high geriatric population. 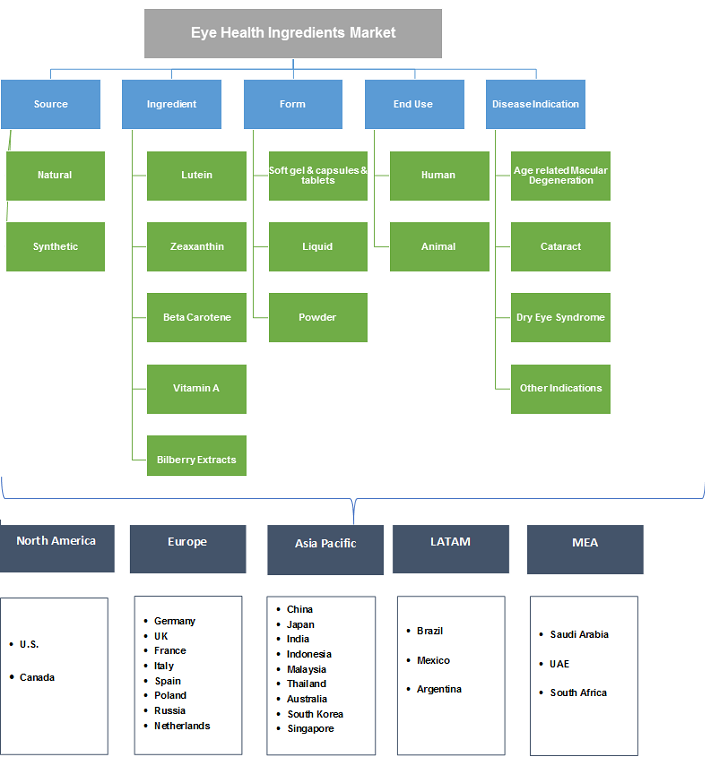 Asia Pacific eye health ingredients market will observe significant growth up to 6.5% as the region is leading in overall dietary ingredient industry. Increasing disposable income and rising consumer interest towards healthy lifestyle particularly in China, Japan and India will drive the regional demand. Global eye health ingredients market share is fragmented due to large presence of ingredient manufacturers. Amway, Alcon, MacuShield, Efamol, Bausch & Lomb, Swanson and Solgar are the potential customers. BASF, FMC Corporation, Allied Biotech Corporation and DSM are the notable industry players. Mergers & acquisitions, product development and expansion mainly by conglomerates are the major strategies implemented. Kemin, Vitae Naturals, Davos life Science and Wilmer Spring Fruit Nutrition are the other industry participants. In October 2015, DSM and Kemin announced two new products, OPTISHARP Zeaxanthin and FloraGLO Lutein to expand their product portfolio in vision health solutions market. Extensive technological development and innovations by the manufacturers introduced gummies with zeaxanthin and lutein content eye health supplements. The product will enhance the demand with macular carotenoid improvements particularly for young children. The multivitamin and nutrient content ingredients are beneficial for eye health maintenance and good vision. The product helps to overcome nutritional deficiency and protects from degenerative diseases including cataracts and macular degeneration. They control the biochemical reaction in the cells and tissues by functioning with enzymes. Rising prevalence of allergies, growing geriatric population, increasing exposure of digital display and changing lifestyle have led to more vision diseases. The U.S. and Japan are the major contributors of the global industry development.